October 19, 2017 – Justin Trudeau’s public persona – the selfie-taking, magazine-cover-gracing, colourful-sock-wearing, global celebrity Prime Minister – has been an integral part of his Liberal Party’s first two years in government. As much as any policy, Brand Trudeau is what comes to mind when thinking about Canada’s government these days. So, what do Canadians think of their PM’s fame? The second installment of the Angus Reid Institute’s two-year review of the Trudeau government finds respondents divided in their personal opinions on Trudeau the celebrity – roughly one-third like it, one-third dislike it, and one-third profess to be “neutral.” Asked whether Trudeau’s celebrity is good or bad for Canada, however, a full majority (54%) say it’s a net positive for the country, compared to fewer than one-in-five (19%) who say it’s a bad thing. This positivity coexists with some more negative views of the Trudeau Liberals’ image-conscious government. Three times as many Canadians say the government has been “putting too much emphasis on ‘PR’ and photo-ops” in its first two years than say it has been “making real progress and getting things done” (44% versus 13%, respectively). 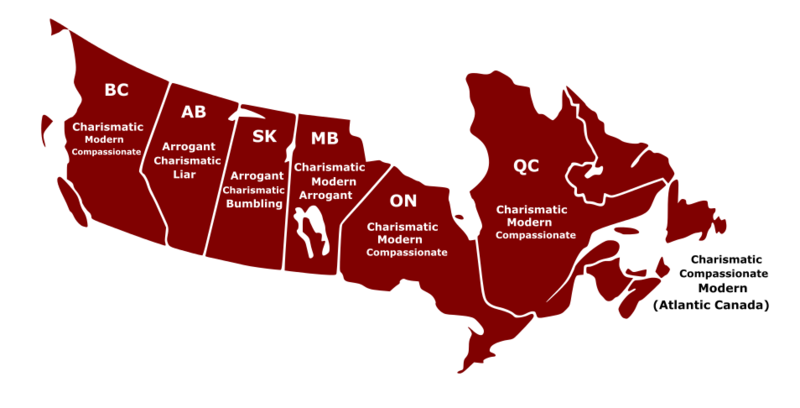 Prime Ministerial personality: How do Canadians describe Trudeau? Tens – if not hundreds – of thousands of words have been written about Justin Trudeau since he ascended to the leadership of the Liberal Party in 2013. Many of those words – such as those in Rolling Stone’s cover story on him – have been fawning. Many others have been anything but. The full list of words – weighted by the relative frequency with which they were chosen – can be seen in the word cloud at the beginning of this report. For a detailed breakdown of responses to this question, see comprehensive tables. In a similar vein, those who voted for Trudeau’s Liberal Party in 2015 are more likely to choose the words with a more positive connotation, while those who voted for Stephen Harper and the Conservatives in the last election are much more likely to pick negative words. Notably, fully one-third of past Conservatives and six-in-ten past New Democrats see Trudeau as “charismatic,” but the number describing him as “modern” and “compassionate” drops off significantly among each party’s supporters, as seen in the graph that follows. At the other end of the list, there are several words that relatively few Canadians think apply to their Prime Minister. Fewer than one-in-ten (9%) would describe Trudeau as “Transparent,” “Uncaring,” or “Boring,” and only 7 per cent describe him as “Traditional.” This finding suggests that the vast majority of Canadians don’t think of Justin Trudeau in these terms. Regionally, some interesting quirks emerge. The following map shows the top three words in each region of the country. Click on the map to see a larger version, and see comprehensive tables for greater detail. The fact that most Canadians believe Justin Trudeau’s public persona is a net benefit to their country doesn’t necessarily mean they approve of his government’s focus on scoring style points. In June 2016, as the House of Commons rose for the summer after Trudeau’s first parliamentary session as PM, the Angus Reid Institute asked Canadians whether they thought the then-still-relatively-new government was “making real progress and getting things done” or “putting too much emphasis on ‘PR’ and photo-ops.” One-in-four respondents chose the former, while a larger number chose the latter. Even among those who voted for them, the Liberals are more likely to be seen as both making real progress and overemphasizing image concerns (32%) than they are to be seen as doing just the former (26%). From the start of his government, Trudeau’s critics have referred to him as “PM Selfie,” a moniker meant to highlight his emphasis on personality and style at the expense – some would argue – of serious policy and governing skill. There is no doubt that Trudeau’s persona looms large in his government and – by extension – Canadian society as a whole today. Canadians’ personal feelings about Trudeau’s fame vary by age. Those under 35 are more likely to describe themselves as “neutral” toward it, while older respondents – especially those ages 55 and older – are more apt to have an opinion overall, and more likely than young respondents to have a negative one. On some level, there is a contradiction in the way Canadians view Trudeau’s celebrity status. While they see it as a net positive for the country, they also see the Trudeau government’s image-conscious messaging – arguably an extension of the Trudeau brand – as a distraction that inhibits the government’s ability to make progress. This apparent contradiction is reflected elsewhere in this Angus Reid Institute poll. In the first report from this survey released last week, most Canadians said the Trudeau government has had a positive impact on Canada’s reputation on the world stage, but gave more mixed reviews to the government’s impact on other files. One possible explanation – which fits with data discussed earlier in this report – is that global reputation is less tangible than other concerns canvassed in this survey, and thus more easily altered by the popularity of a charismatic leader. On the world stage, Trudeau’s celebrity is an asset to Canada, and a good thing overall. On domestic issues, however, Trudeau’s celebrity is no substitute for policy results. For detailed results by 2015 federal vote and approval of government performance, click here.